I did a big cleanup of my collection of parts today and I now have a big pile of parts on my desk (the majority of which is resistors). My previous method of finding the resistor value I wanted was to look through my little box and read the colour codes. Unfortunately I now have a lot of resistors, making an individual search almost impossible. Instead of reinventing the wheel, I put it to you my fellow chiphackers: do you know of any efficient (as in fast recall) ways to store and categorise components ? I understand you can get lots of small drawers but it seems like such a waste of space to put only a single resistor of an unusual value in its own drawer. I keep resistors in drawers organized by the first digits of value. I printed the E12 resistor series eight-to-an-A4 page, cut them up and purchased 100 ziplock bags (on eBay) to suit. The plywood box was a woodwork project! This upgrade replaced my previous similar system that lasted > 30 years. For SMD: This is about my favorite thing ever created I also have one of these for low volume stuff that comes on tape and is useful for testing, ferrite beads and such. For ICs / connectors: I don't really reuse a lot of this stuff from design to design so they are normally just kept in their digikey/mouser bags and kept in the project box with the PCB's and connectors etc. I'm fairly good at keep a running inventory of what i have and what project it was for on my workstation so i can usually find this stuff quickly. For Through Hole: I really don't use this stuff much. I have a fishing box style assortment of ceramic caps, one of 1% 1/4W resistors, one of aluminum caps, and one full of other stuff, diodes and transistors, etc. I don't really use this very often with the exception of a resistor or cap here and there if I need to blue wire something onto an early rev design. This could definitely be better organized. 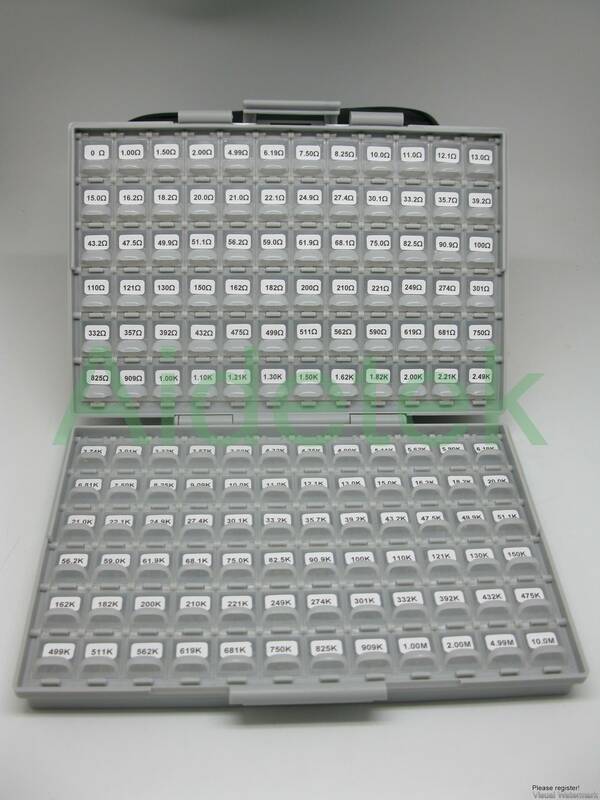 Last time I bought a resistor assortment from Farnell (61 values x 100 pieces each) I bought them with a cabinet with 60 drawers. The cabinet was virtually for free, compared to the cost for 6100 resistors. For SMD I find Licefa V11-3 boxes extremely handy. Each of the 60 phials (about 1cm x 1cm x 2.5cm) can contain tens of 0603 or SOT23 parts, and because you take the phial out of the box when you need a component they don't get mixed up. Very important for MLLC capacitors, since they don't have a marking. Box exists in 60 or 130 phial versions. My only issue is that the phials aren't anti-static. We keep our through-hole resistors in small ziplock bags, and keep those bags in baseball card organizer pages (the plastic loose-leaf pages with nine pockets on each side). All of them fit in a three-ring binder. Whenever we need a particular value, we just page through the book. We also add a little card to each pocket with the value that belongs there, so we know what to restock when we're out. The downside is that if you turn the book upside down you're going to make a huge mess, but amazingly enough, in the two years we've been using this system that hasn't happened once. 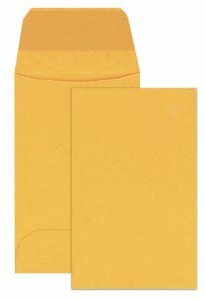 Coin envelopes. Size #1, 2.25" x 3.5" (although I used to be able to get smaller). 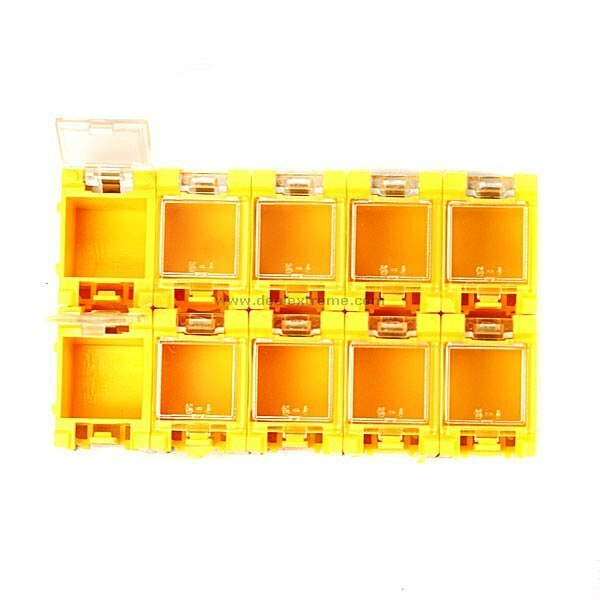 Known to Amazon as "Coin and small part envelopes", because small parts is the other thing people (used to) keep in them. You write the part number / value on the envelope, and just line them up in a box in order. 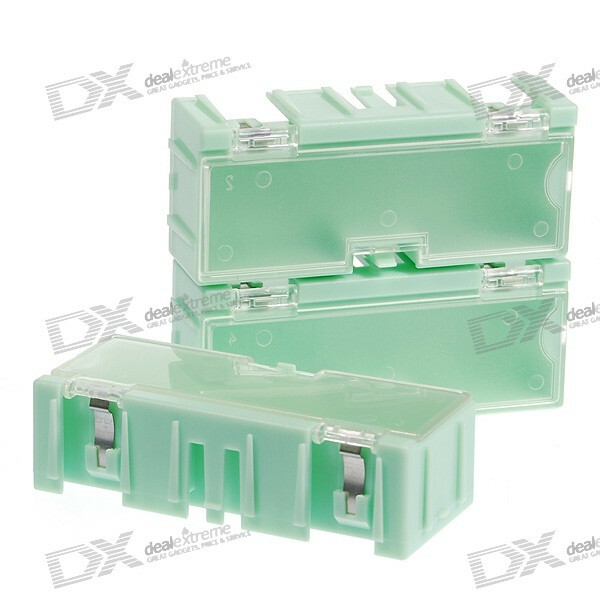 Stores much more compactly than any small-plastic-box solution, is suitable for reasonably flat parts like resistors, small capacitors, cut-tape prototypes, flat-pack chips, and is easier to read and label than a plastic bag. I am a Physics teacher and came up with this idea for storing resistors that I use time and time again when doing practicals with resistance. I have also added other components so I don't have to go looking for them in little pots etc. This works well for me as I don't have loads of components, but just enough for it to be a pain to not have a solution like this. I keep mine in small labeled envelopes (hand-written), with each decade in a labeled larger envelope, and keep them all in a cardboard box. I have every value from 1R0 to 10M0 (1% metal film) stored that way. I ought to sort the small envelopes before putting them back in the large envelope, to save time finding a particular value, but I don't bother. For TH and larger parts I use lots of small drawers. I also use the Akro-mils cabinets with dividers. http://www.amazon.com/gp/product/B00018AR5Y/192-5968131-0652527 These are nice because you can different draw sizes in a 17"x11"x11" cabinet. Very expensive unless you can find them surplus. One very nice thing about the tins is they are small. For most designs you can kit up the different components on your bench. If really pressed for space, I think I'd lump everything 100 ohms and under in one bin, everything 1M and above in another, then one bin each for 100-1K, 1K-10K, 10k-100k and 100k-1M, but those things with all the little drawers are very cheap and easy to come by. Then just start making labels (color-coded labels in excel work great - put the color code on there for your reference). In fact I have the labels I made with color codes. I think if everything still works right after uploading to Google Docs that these should print out on mailing labels - maybe two or three to a label? Here is an Instructable article on how to use ordinary book binders with zipper bag inserts. You can store smaller ziplock bags inside the larger zipper bags using one of the sorting schemes others have suggested here. BTW, I would have just added this as a comment to phooky's answer, but I don't have rep on this site yet. Basically the same thing, but they won't fall out when turned upside down line the baseball card holders. I use glassine envelopes and keep them organized with little tab dividers. They're cheap enough to have one for each value and expandable enough to hold all of my SMD and most of my through-hole components. A classic resistor storage solution was made by one of the resistor manufacturers, can't remember which off hand. our shop her at work has a large rack of them 8 long bin slots per drawer, 4 drawers per cabinet , and yeah when we have ALL 10% values in both 1/4 and 1/2 watt, thats a few racks (grin), then add another two rows for some 1 and 2 W, but with fewer values among those. I think they were, may still be made by Ohmite. not sure where you find them and we could use a couple more. My recent restocking of those drawers found a few slots missing from the complete selection I ordered (grin). Will try to get 1) a photo of one, and 2) a source, just in case you really want one.. the bins WILL hold 200 of the 1/4 watt ( proven by test,smirk) less of anything larger ( like the 1/2s). I no more than wander away from here, than I find a pretty good picture of this box type on EBay. 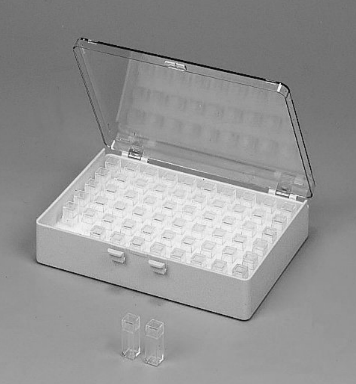 While I am thinking about it, when I set up my home shop I had access to some rather perfect small flat tray boxes. two of them could hold a complete decade of the standard 10% values at about 10 per value. 14 of these convienently fit on a small area of the shop bench. 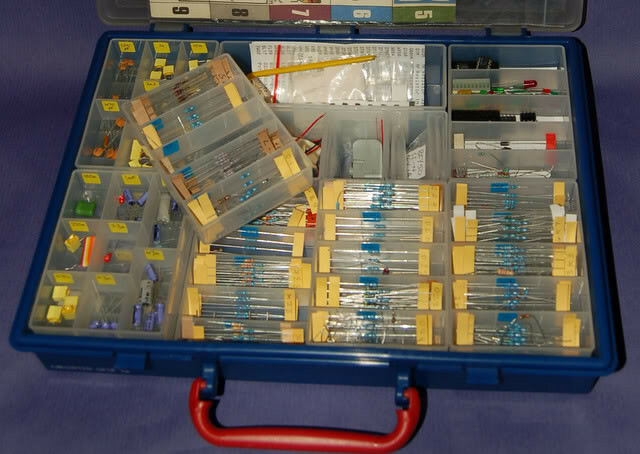 recently I found a very large stock from a local 'silent key' ( radio ham that passed away ) THAT had a substancial section of resistors and came in a semi organized 60 drawer acro-mills cabinet, which has become my enhanced shop stock. I've been contemplating a system using labeled envelopes, but I haven't actually done it yet. I've put some of the passives in ziplock type freezer bags. They're transparent and you can write on them easily. Minigrip brand mini bags are about 10x10cm and I could file them in an old floppy disk organizer box. It's not quite ideal, though. Fresh resistors and diodes are kept in those "belts" as long as the glue holds and SMD's are in their tapes. 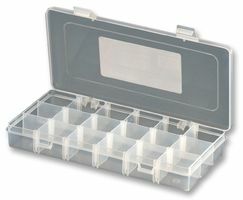 I found a source for surplus lot of those plastic boxes (also transparent) with lots of little compartments. I put a piece of tape on each with a number and have kept a small database that tells me what chips to find in which box and how many I have. Those boxes are nice in that they protect parts mechanically. They tend to be horribly expensive, though. I also have some IC tubes and (Maxim's sweet sweet snappy) sample containers, ESD foam etc that I've gathered over the years that I can store stuff in. And finally there's a few small drawer units from Ikea that I keep tools, batteries and solder/wick/flux/paste etc in. I absolutely hate those "organizers" that shops use with the metal frame and hard plastic drawers that gather dirt, waste space, rattle and every now and then spray all the contents on the floor when you open a drawer quickly and the stop catches and it does that magic slip and flip. There's probably no single container to end all containers. Personally I use the same thing I've used ever since I was a kid; a little "cabinet" full of plastic drawers. You see them at any hardware store for holding nails and screws and nuts and bolts. Cheap and works pretty well, although if the cabinet tips you're in for a bit of a job. I organize them numerically; Starting with the smallest capacitors (1-50pf, 51-500pf, 501-999pf, etc.) in whatever "jump" works. e.g. I only seem to use 4.7pf, 22pf, 47pf and 100pf caps in that range, so they all go in one bin. I have 0402, 0805, 1206 and through-hole caps in the same drawer, unless the TH parts are big. It's really not that big a chore to pull out a drawer and look for the right package. For "common" values (0.01uF, 0.1uF, 10uF, etc.) they each get a drawer all to themselves, usually with the through-hole variety in their own drawer. I find I buy 500 of the one kind of cap, and just the SMT size takes up most of the drawer. I do the same with resistors and inductors. For semiconductor devices, I have all the small-signal diodes in one drawer, all the zeners in another, all the rectifiers in another (again, with TH in their own drawer becuase they're big)... I have a drawer each for red, green, yellow and blue LEDs, and my NPN and PNP transitors get separate drawers too. Solder and angel-hair wire (I actually use "bare" (bus) 30AWG wire and 26 or 28AWG nylon tubing) go on threaded rods which sit in a holder made out of angle-iron. THis lets the spools turn and keeps the spools out of the way. I think I'll end up putting all the through-hole devices in a separate cabinet of drawers. ICs I tend to keep in a box, although the smaller and more common devices will end up in drawers as well. For passives (resistors/caps) I use little coin envelopes, one value per envelope, with the envelopes kept in a shoebox that's subdivided so they can stay upright and in order. I segregate by types, of course. I previously used a hole punch to put a hole in each envelope, and then strung them on a keyring, but as the number of values increased, that got a bit unwieldy. For ICs and the like, I have so few hanging around that I just keep them in little ESD bags in a box. With so few to look through it's not worth better organizing yet. The horizontal dividers are removable, and the bottoms are curved so it's easy to pull out small components; they don't get stuck in corners. 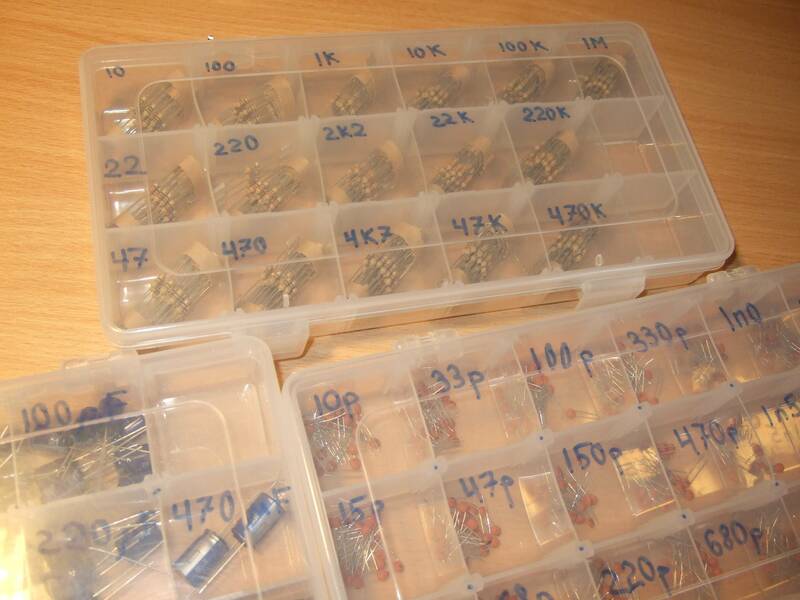 If you work with SMD resistors and capacitors kitboxes are the best. You can find them on for example on ebay with the keywords: "smd resistor kit box" and "smd capacitor kit box"
I keep my low-power resistors in empty matchboxes glued side by side and labeled with the resistance range. For example, the first matchbox is for resistors below 100 Ohm; the second is for 100<=R<1k; the second is for 1k<=R<10k etc, and the last is for resistors equal to or above one Megaohm. 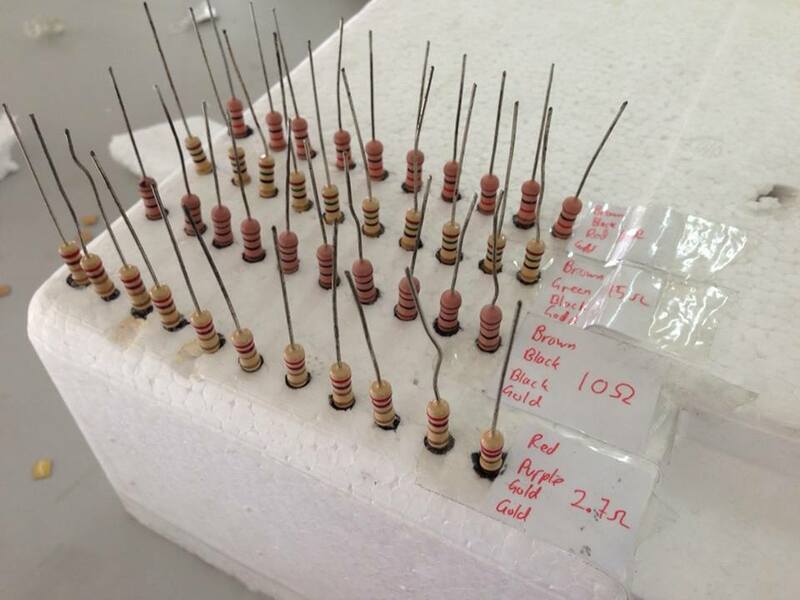 A matchbox full of matches costs the same as two 0,25W 5% resistors here. 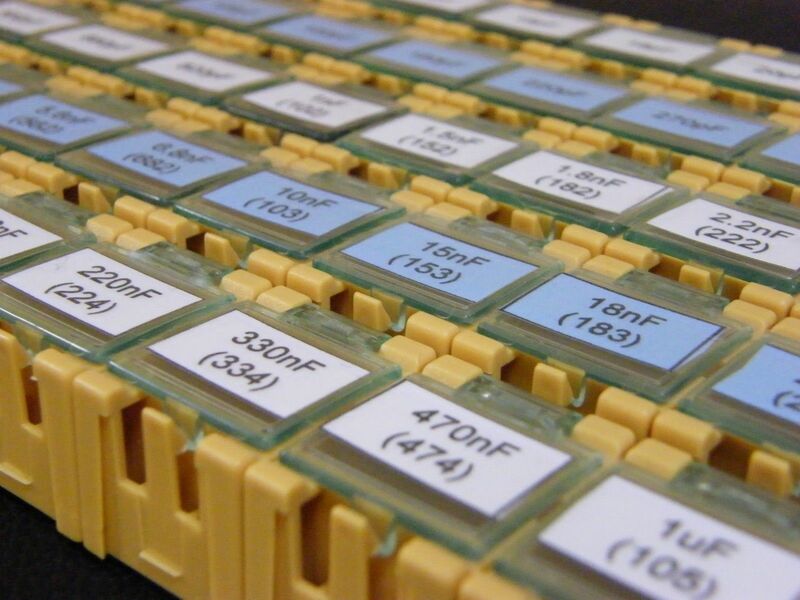 For smaller quantities, try putting them on a piece of Veroboard. I used to do this when I was a TV engineer. Easy to store and easy to read off the values. 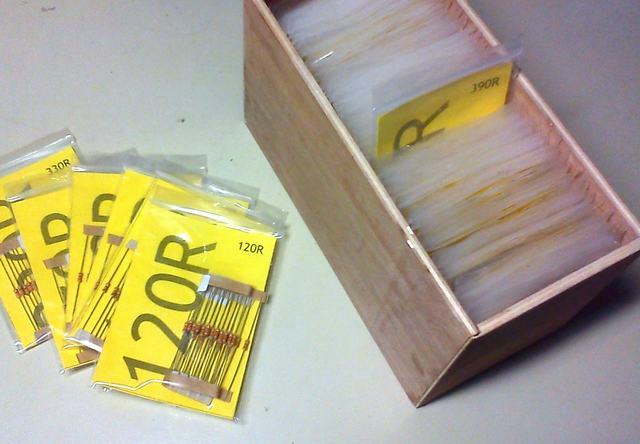 I also used a card index drawer which was just the right size for filing the bags of ten resistors that we got from RS. Well, I use old sweet boxes which have sections like the 2 I'm using have 7x10 and 6x8 which are similar to many boxes shown here. With the only difference that there are free. Some similar chocolate boxes are also there. This product -- as simple as it is has really helped me to become more organized. It is a box that contains several plastic bags. Each bag is labeled with the resistance value. When I get a new resistor it goes in the index (I have a different index for each Watt rating). When I need a resistor I simply flip to the value that I need and quickly only check the color bands when precision is a concern. The box includes 86 values from zero (seriously) to 10MΩ and is organized from lowest value to highes. It even has a handy color chart on the inside for quick reference. It comes pre-loaded with 10 1% precision resistors for each value (860) pieces. I have reduced the range of resistors for prototypes to 1.0 1.5 2.2 3.3 4.7 6.8. This reduced the total number of boxes and meant buying larger numbers of the same resistor value. In NZ the difference between wholesale say a box of 1000 and retail say 1 to 10 was many times. I have the decades on one axis (usually the Y axis_ and the cut down preferred values on the other (usually X axis) of the minidraw set. Due to supply inconsistencies in NZ the draw sets keep changing when I set these up for others. The key of matrixing the decades with the shortened preferred value range is to reduce the chance of selecting the wrong resister. Ability to read the colours doesn't improve with age. This worked OK for me and when SMD parts arrived in numbers I just put them in the same drawers. I know everyones work is different and the more digital the work is the fewer values you can get away with. Clearly if you are doing lots of Analog then you will want more values. What some others do is have every conceivable resister value and stock very few caps. This is sensible because resisters are far cheaper than quality close tolerance caps. Not the answer you're looking for? Browse other questions tagged resistors components storage or ask your own question. What are the Best Starter Supply Kits? How do I keep my inventory items well-organized and tidy? What's the cheapest way to detect vibration with Arduino? Why are the “common” resistors and capacitors rated the way they are? Any good solutions for dealing with resistors for color-deficient tinkerers? What's the use of tantalum resistors in audio circuits? What's the difference of placing multiple resistors and one resistor for limiting the current of LEDs?